A desert island in the Bahamas is to be transformed into a marine reserve and exclusive resort for cruise passengers. Over the next two years, $200 million (£134 million) will be spent to create Ocean Cay from a former sand extraction site 65 miles east of Miami. MSC Cruises says that, working with the Bahamian government, it will turn the 95-acre island and the local economy “from resource exploitation to resource conservation.” It will become the biggest private resort operated by cruise lines sailing in the Bahamas and to the Caribbean. Ocean Cay has 2.4 km (1.5 miles) of beaches, divided into six distinct areas. The development will add a pier to enable ships to tie up at the island and passengers to walk ashore. Entertainment facilities to be built include a 2,000-seat amphitheatre, bars and restaurants. 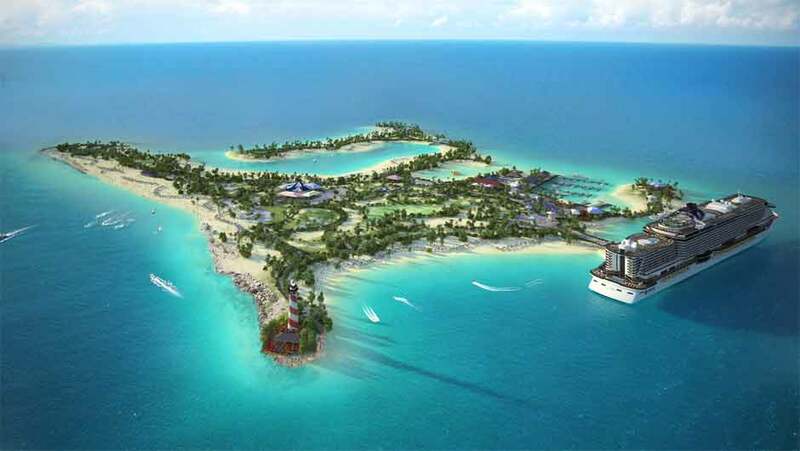 One corner of the island is to be reserved for passengers travelling in MSC ships’ exclusive Yacht Club, who will be provided with a wellness sanctuary, private bungalows and massage huts. Work on the development starts in March and Ocean Cay is scheduled to open for business in November 2017. Ships expected to include the resort in their itineraries include MSC Divina and the brand-new MSC Seaside – currently under construction – both sailing from Miami, and MSC Opera and MSC Armonia, sailing from Havana, Cuba.